Style.com's featured beauty icon, Mexican actress Maria Felix, was described in the write-up as " an unrepentant diva...had a penchant for collecting husbands (four, officially) and lovers (Diego Rivera, for one) that was only surpassed by her love of jewelry." The diva that she was, she deserved nothing less than an emerald-and-diamond-encrusted gold necklace modeled after baby crocodiles. This was said to be the piece de resistance of a collection Cartier released in her honor last year. According to style.com, the piece was specially commissioned for her. 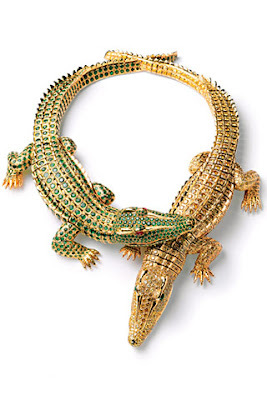 "She is reported to have stalked into the Paris boutique with a baby crocodile in tow and asked the stunned jewelers to replicate the reptile in gems, stipulating, no less, that the piece be done to scale." How come we don't have anymore of these glamorously crazy women these days? oh my god, whoever you are. i love your blog! it makes me feel being a little too obsessed with fashion is jussttt fine. ive read your first post too, and i can so relate. middle class, yes, yes, of course i am. and i dont deserve my own lv bag just yet, i know i know. i must satisfy myself with borrowing from my mom or an aunt if we're close... but still. Thanks so much! I know what you mean, I get a lot of that. Like I have no right since I have to blow an entire paycheck to get those goodies...! Hahaha! So what if we're not socialites or stars, a girl can dream until she gets it right?